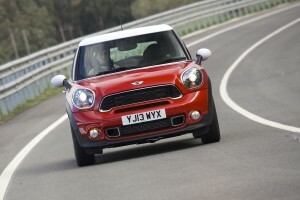 New Mini Cooper Paceman 2013: Crossover Coupe Spec Revealed! Mini has unveiled its latest incarnation of its Mini Cooper Paceman model which has a new sporty exterior, lowered suspension and an improved interior. The Mini Cooper Paceman is not as well known as the Countryman though it is a better car which comes with a £1,000 premium. Essentially Mini Cooper Paceman has been styled as a coupé interpretation of the Countryman and there are five versions are available from launch. Among them is the Mini Cooper S Paceman which has a 0-62mph of just 7.5 seconds. The seventh unique member of the family, it sells alongside the Hatch, Clubman, Convertible, Countryman, Coupé and Roadster. Packed with Mini character it is built on the Countryman platform, bumper to bumper the car is 4,109 mm (4,115mm for Mini Cooper S Paceman and Cooper SD Paceman), which makes it almost identical in size to its sibling. The Mini Cooper Paceman has been created to appeal to a new type of design-conscious customer looking for the promise of sporting performance, hence the lowered suspension. The coupé-style stretched side profile features long doors, while the blacked-out pillars create a ‘floating’ roof concept, as already seen on the MINI Coupé. Available in either black, white or body colour, the roof gently slopes towards the rear of the car, ending at the integrated spoiler. The horizontal arrangement of the rear lights, which accentuates the car’s width, is a first for MINI. Also, the Mini Cooper Paceman is the only member of the brand’s line-up to be identified by a rear nameplate. There’s a choice of four powerful four-cylinder engines, two petrol and two diesel. All come with a six-speed manual gearbox, or the optional six-speed automatic with Steptronic function for manual control. The 1.6-litre 122bhp petrol unit offers a 0-62mph time of 10.4 seconds and fuel economy of 47.1mpg with CO2 emissions of 140 g/km. The MINI Cooper S Paceman uses the same engine, tuned to deliver 184bhp. It will sprint to 62mph in 7.5 seconds with fuel economy of 46mpg and emissions are 143g/km. Diesel lovers will enjoy the 1.6-litre 112bhp turbocharged engine with a 0-62mph time of 10.8 seconds. It provides owners with a frugal 64.2mpg fuel economy and 115g/km emissions. The Mini Cooper Paceman starts at £18,970 on the road. This entry was posted in Car Updates & Releases, Crossover Cars, New Cars, Small Car and tagged 4X4, car, Compact Car, countryman, coupe, Crossover, fuel economy, GEM, Hatchback, LS, mini, Mini Cooper Clubman, Mini Cooper Convertible, Mini Cooper Countryman, Mini Cooper Coupe, Mini Cooper Hatch, Mini Cooper Paceman, Mini Cooper Paceman 2013, Mini Cooper Paceman Emissions, Mini Cooper Paceman MPG, Mini Cooper Paceman price, Mini Cooper Paceman Spec, Mini Cooper Paceman Speed, Mini Cooper Roadster, mini cooper s paceman, New Mini Cooper Paceman, S line, speed, Sport, the Countryman by Steve Lumley. Bookmark the permalink.